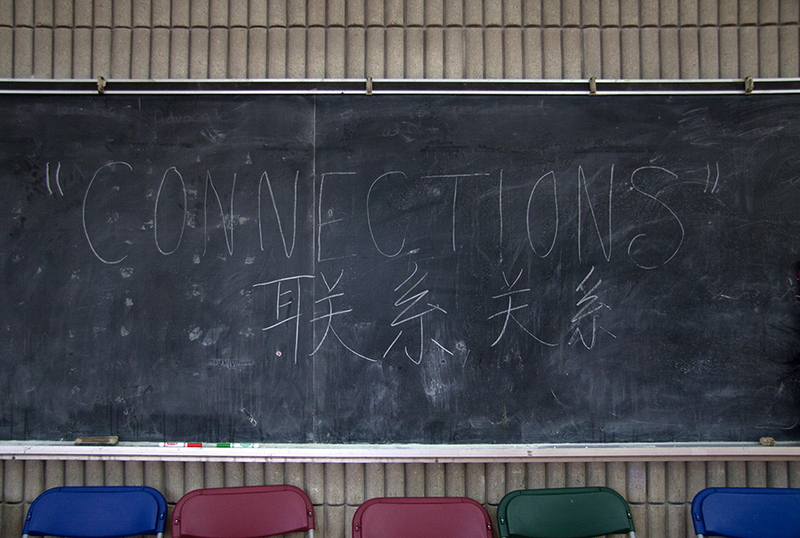 A group of older adults have been participating in workshops at Scadding Court Community Centre, near one of Toronto’s Chinatown communities. MCT facilitators, Simon, Kristin, and Amelie are working collaboratively with Stephen and Jenny, from Aiding Dramatic Change in Development (ADCID) using CrossGEN (a method for facilitating cross-cultural understanding) to build on MCT’s interGEN and forum theatre programming for the predominantly Chinese Canadian participants. Supported by a Mandarin translator, the older adults are guided to pay attention to movement, facial expressions, and creative ways of communicating, across cultures. The facilitators continuously guide the participants to pay attention to the journey, and the process: to enjoy the time that is being spent exploring identity and connecting their experiences. In one exercise, all of the older adults danced around the room, making sure that their movements and mood reflected the type of music being played. Their body language and movements illustrated the different ways they interpreted the sounds they heard, yet all seemed to move in sync. The intention of the CrossGen and interGEN programming is to stimulate cross-cultural communication and understanding, across and within difference— a verbal dialogue is not always necessary to stimulate awareness of different perspectives. In another exercise, through the construction of sculptures, both the participants and facilitators realized how differently they would interpret body postures. Simon sculpted two of the participants back to back, as an image of disconnection. Yet, the participants sculpted a similar image, of two people sitting back to back, as one of connection, explaining how couples would take this romantic pose, back in their day, in China. In another activity, the participants chose a picture from a table covered with a range of images from around the world. In a sharing circle, each participant had the opportunity to share their photo and how they felt connected to it. Some shared in English, but most spoke in Mandarin and through the translator, everyone heard each other’s stories: trees that represented the struggle to survive and the idea of growing old with new leaves, were some of the images that conjured through this dialogue. The image of the bicycle came up over and over again; everyone appeared to have a bicycle story, and it sparked an emotional reflection on what was then, and what is now. In the 1920s and 30s, bicycles were initially reserved for the upper class or for those who had spent time abroad. By the late 1930s when China began to mass-produce bicycles, many people in China began to utilize this new form of transportation. The bicycle is called zi xing che (自行车) in Chinese, meaning, self-driven transport. Currently, there are approximately 430 million bicycle owners in China. Lots of photos and stories emerged around the circle, but all were connected – each one gave someone in the room deep insight and connection to themselves, to each other and to the world. A lot of people connected to earlier time in their life: a memory, a special moment, a feeling or experience. Discovering such connections is part of intergenerational programming does – by providing space to make meaning of such experiences. The workshops are ongoing twice a week, and will culminate in a performance at Ryerson University’s 50+ Festival, where this group of older adults will perform moments from their lives, on Thursday June 4th. The blog entry was contributed by Christina Parker (MCT’s volunteer researcher) and Amelie Sterchi (MCT’s international intern from Switzerland).